The Fanvil D900 is a VoIP Video phone that is based on Android OS 4.1 voice calls, video calls, web browsing and Android apps on one desktop device. The large adjustable 7” touchscreen LCD HD display gives the D900 a large easy to use display no matter what you are using it for. 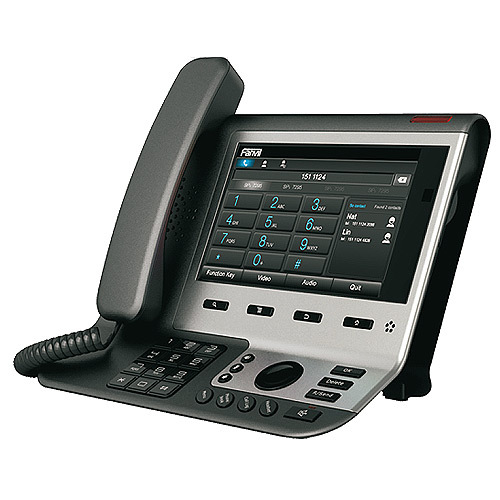 In addition to the to the touch screen interface this Fanvil IP Phone also has a more traditional hard key interface including the traditional telephony features. For voice calls the Fanvil D900 supports SIP 2.0 and correlative RFCs with the option of supporting IAX2 and PSTN calls. It also supports a range of Voice Codecs including G.722 wideband codec. For video calls and multimedia the D900 has a 2 mega pixel front mounted camera and supports H.263, H.264 and MPEG4 in addition to several video and image formats. The Fanvil D900 has several ports that make it versatile for different applications. There are dual LAN/PC 10/100 Ethernet ports which allow it to hand off internet connectivity to a second device such as a computer. A USB 2.0 port is available for loading images and applications on your Fanvil phone. For privacy when you are making voice or video calls the D900 has a 3.5mm headset jack.